If you’ve got a Mac with multiple audio outputs, or even if you just use a one-output Mac with a USB-audio accessory, it can be a hassle to switch between your various audio devices. 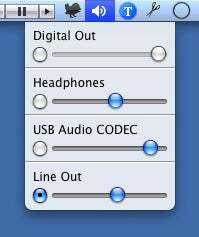 As an alternative, I’ve previously covered Rogue Amoeba’s SoundSource and Aspirine.li’s Sound Menu, two utilities that let you switch your audio output via a menu-bar menu. But since installing Leopard on my Mac Pro, I’ve been using PTH Consulting’s PTHVolume 2.1.0 ( ; free), which offers a few unique features. PTHVolume has actually been around for a long time — since 2001 — but was “retired” a few years ago. The developer brought the utility back with version 2, a Leopard-only version that’s a major improvement over the original. Once installed—unlike SoundSource and Sound Menu, PTHVolume doesn’t use input managers or menu “cracks”—PTHVolume provides a handy menu-bar menu showing all available audio outputs, as well as each output’s current volume setting. (You can choose to display the volume sliders horizontally or vertically.) Simply click on the radio button next to the desired output to switch to it; click-drag the appropriate volume slider (or click at the desired volume position) to change the volume. PTHVolume is unique in that it lets you set different volume levels for each output, so you don’t have to adjust the volume each time you switch from, say, external speakers to headphones. But PTHVolume also has a number of other unique features. The most noteworthy is the ability to assign keyboard shortcuts to various actions. For example, you can assign shortcuts to quickly switch to specific audio outputs; I’ve assigned Shift+Control+H to the headphone jack and Shift+Control+L to the line-out jack, so I can now switch from headphones to speakers and back using the keyboard. You can also assign shortcuts to Volume Up, Volume Down, and Mute—either master controls (which affect the volume for the currently-selected output), separate controls for each output, or both. Although this capability may seem unnecessary to those with Apple keyboards, it’s quite useful for people with third-party keyboards that don’t have built-in volume and mute keys. I also like the little touches that make PTHVolume easier to use. For example, you can quickly toggle Mute mode on and off by right-clicking on the PTHVolume menu-bar icon. And when viewing the menu, your mouse’s scroll wheel adjusts the volume of the selected audio output. You can also rename non-standard devices—for example, USB-audio devices—in the PTHVolume preference pane to make their names more meaningful. On the other hand, unlike SoundSource and Sound Menu, PTHVolume doesn’t let you choose a different output for system sounds than for other audio. It also doesn’t let you switch between headphones and the internal speaker, although that’s a limitation of Apple’s hardware that the developer can’t get around. Two things I’d like to see in future versions are some sort of onscreen confirmation of output-device and volume changes, and for the menu to display, next to each output, the keyboard shortcuts you’ve chosen (if not all shortcuts, at least the shortcut to switch directly to each output/device). PTHVolume isn't for everyone. But if, like me, you have several audio outputs, or if you’re using a non-Apple keyboard and wish it had volume and mute controls, PTHVolume is a must-have. 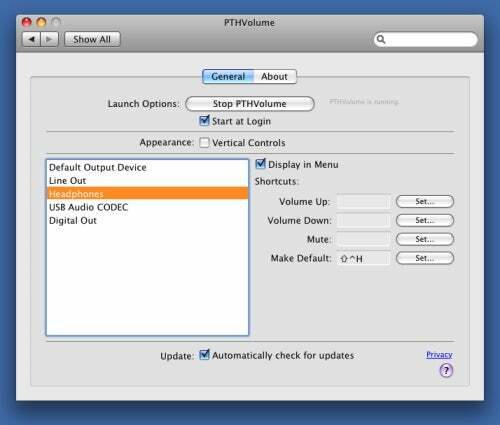 PTHVolume 2.1.0 requires Mac OS X 10.5 or later.